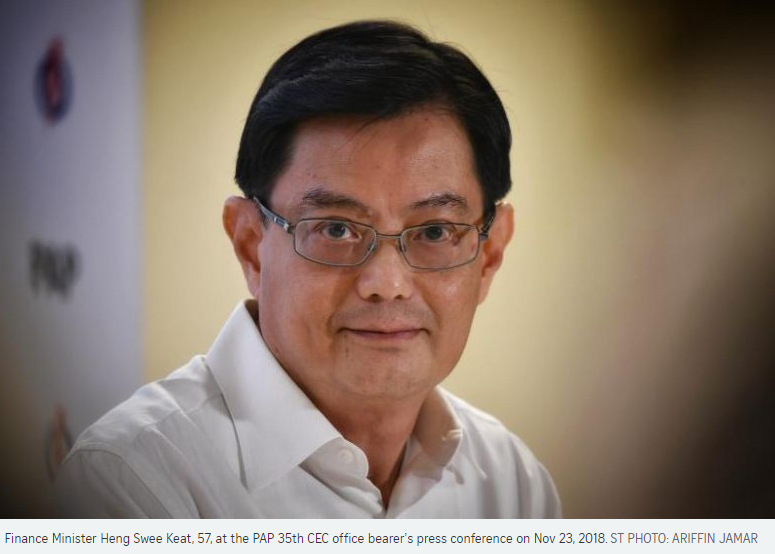 Finance Minister Heng Swee Keat, 57, has been chosen to lead the fourth-generation (4G) team of the ruling People's Action Party (PAP), paving the way for him to become Singapore's next prime minister. Mr Heng is now the party's first assistant secretary-general, with Trade and Industry Minister Chan Chun Sing, 49, playing a key role as second assistant secretary-general and his deputy. The announcement of their roles yesterday in the new slate of office-holders for the PAP's highest committee marks a major point in Singapore's leadership transition and answers the pressing question of who will succeed Prime Minister Lee Hsien Loong. Speaking at a media conference at the PAP headquarters in Bedok yesterday evening, Mr Heng said the younger team chose him as their leader, and he accepted it. He then asked Mr Chan to be his deputy, saying the former army chief and labour chief has many strengths and would complement him very well. Mr Heng said: "Leading the party and governing Singapore are massive and complex tasks. No one person can do it alone." It was a point both he and Mr Chan reiterated several times at the press conference. "I am heartened that I have the backing of a strong team," he added. A group of 30 younger PAP MPs issued a statement yesterday saying they reached the consensus that Mr Heng will lead the team and endorsed Mr Chan as his deputy. In a Facebook post last evening, PM Lee, the party's secretary-general, said he supports their decision and is happy with the outcome. Mr Heng and Mr Chan have complementary strengths and make a strong pairing, PM Lee added. "I am confident that they will continue to grow in experience and touch, and steadily win the confidence and trust of Singaporeans." The Prime Minister also said he will announce changes to the Cabinet in due course, and observers expect Mr Heng to be appointed deputy prime minister. Both Mr Heng and Mr Chan entered politics in 2011 and have held various key portfolios. Mr Heng was made education minister, and chaired key initiatives like a national conversation series to engage citizens and a committee tasked with devising strategies to grow Singapore's economy in future. But his political future came under serious doubt when he suffered a stroke during a Cabinet meeting in May 2016. He, however, made a miraculous recovery and returned to work about three months later. Yesterday, Mr Heng gave the assurance that his doctors have given him a clean bill of health, and said he is in even better shape than before. "I would not have taken up this appointment if I do not have the confidence that my health allows me to do it," he added. On why he picked Mr Chan as his deputy, Mr Heng said they complement each other well in their styles and areas of expertise. He cited how they have good experiences working together, including setting up the Early Childhood Development Agency. Mr Chan has been doing a lot of groundwork with various organisations, including the labour movement, the People's Association and the party itself, he noted, adding: "It is important that we pool together our strengths to mobilise." On his part, Mr Chan said he has great respect for Mr Heng's capabilities, particularly his considerable international experience and knowledge of financial markets. "As a team, we will complement one another, leveraging our respective strengths to do our best for Singapore," he added. The PAP's 4G team has strengths in different areas and a range of skills to deal with a complex set of internal and external challenges, Mr Heng said. "I am confident that we will work well together to take Singapore forward and to improve the lives of Singaporeans." Finance Minister Heng Swee Keat said yesterday that surviving a serious stroke two years ago was a "very major life-and-death episode" that strengthened his commitment to serve Singaporeans. The reason is that "I, personally, and my family, feel the care and support that so many Singaporeans gave to me, including people from different religious groups,'' he added at a media conference after it was announced he is the new first assistant secretary-general of the ruling People's Action Party. He said: "I felt that I should do my very best to serve Singaporeans, to make sure what we have achieved in Singapore can continue and, in fact, build on that because we must continue to improve the lives of all Singaporeans whether in healthcare, creating good jobs or better housing or better education." He added: "We owe it to all Singaporeans to do this, and I hope certainly with (Chan) Chun Sing and the support of my team, we can do this. I hope many more people would join us in this journey." Mr Heng, who collapsed in the middle of a Cabinet meeting after suffering a brain aneursym in May 2016, said he would not have assumed leadership of the PAP's fourth-generation team if he was not confident that he was healthy. "I have made very good recovery; the doctors have given me a clean bill of health. "In fact, at my latest medical check-up, my results were even better than before. I have lost a bit of weight, but that is because I am fitter now," he added to laughter from reporters at the event held in the party's headquarters in New Upper Changi Road. Turning serious, he added: "I would not have taken up this appointment if I did not have the confidence that my health allowed me to do it. I consulted my doctors, looked at the medical reports as well as my own energy level." Mr Heng returned to work three months after the stroke but stayed away from public events as his immunity was low. He gave his first public interview that December, and in February last year, returned to Parliament to deliver the Budget. Since then, he has made many overseas trips, with his third to Argentina this year taking place next week when he attends the Group of 20 Summit. Just one way, the trip would take about 30 hours. He said with a smile: "I am travelling more than when I was MAS (Monetary Authority of Singapore) managing director." The newly confirmed leader of the ruling People's Action Party's fourth-generation team has said he will lead in an open and consultative manner. And when a decision needs to be made, he will move decisively, Finance Minister Heng Swee Keat, 57, said yesterday. Reporters had asked Mr Heng, frequently described as soft-spoken, about his leadership style. The PAP's new first assistant secretary-general said this was best answered by the people he worked with in his three decades of public service. But he added: "My own sense is I am very open, I listen to all views, and I decide what needs to be done. "When it is important enough, we will be fast and decisive about it, just like what I did during the global financial crisis (in 2008 and 2009), because every minute of delay means far greater risk." Since his entry into politics in 2011, Mr Heng has garnered a reputation for being consultative, having chaired multiple committees to gather the views of Singaporeans, including the Our Singapore Conversation in 2013, and more recently, the Future Economy Council. The consultation process has had a long history in government and will continue under his watch, Mr Heng said. "Increasingly, as more Singaporeans have interesting perspectives, we will enlarge this consultation. And I will say we are going beyond consultation," he added. "We want to encourage our people to not just offer a view but, where they can, to play a part in building Singapore, whether it is at the community or national level." He cited the example of the Community Network for Seniors, which taps a huge network of voluntary welfare organisations, grassroots groups and government agencies to provide social and healthcare services to the elderly. "We were able to mobilise the younger seniors as well as some very young people to form a network with our seniors and, as a result, we can take much better (care) of our seniors," he said. "That is the way to go: That as our needs multiply significantly, this partnership will grow in importance." Minister in the Prime Minister's Office and Second Minister for Finance and Education Indranee Rajah said one of Mr Heng's defining traits is that he consults widely, but also has a clear vision. "He will not act on his vision until he is satisfied he has heard from others," she said. Another hallmark is his emphasis on partnerships, she added. "He is very keen to work with people and different groups because he is firmly of the belief that it is not one entity, one person or one organisation that can do it alone," she said. Even as he highlighted his decision-making skills, Mr Heng also underscored the importance of teamwork. "It is important that we have a strong, united team in Cabinet... because I have seen so many examples in other countries where the energy is not focused on going forward but instead the energy is focused on the internal squabbles and on looking at the past," he said. His deputy, second assistant secretary-general Chan Chun Sing, said: "Teamwork, going forward, is not just about the two of us, not even just within the Cabinet or between fellow party members. It is the mobilisation of the entire Singapore to come together. "No matter how good we are individually, it is... not sufficient. What distinguishes the Singapore team from the rest of the countries with whom we are competing is the fact that we have a very cohesive team." Mr Heng Swee Keat and Mr Chan Chun Sing have "complementary strengths and make a strong pairing", Prime Minister Lee Hsien Loong said yesterday in his endorsement of Mr Heng as the People's Action Party's (PAP) new first assistant secretary-general and Mr Chan as the second assistant secretary-general and Mr Heng's deputy. "They and the other younger office-holders have gradually come together, to work as a team and make the most of the strengths of each team member," PM Lee, the ruling party's secretary-general, said in a Facebook post. "I am confident that they will continue to grow in experience and touch, and steadily win the confidence and trust of Singaporeans," he added. Mr Heng is the Finance Minister, and Mr Chan, the Minister for Trade and Industry. Calling the election of the new Central Executive Committee (CEC) a "major step forward" in the PAP's political renewal, PM Lee said the younger ministers and political office-holders have been meeting in recent months to discuss who should lead them. They reached a consensus that Mr Heng will be their leader and Mr Heng, in turn, asked Mr Chan to be his No. 2, PM Lee said. Mr Heng's decision was also endorsed by the younger team. At a party caucus held to brief the MPs on the new line-up of CEC appointments, the choice of Mr Heng and Mr Chan as first and second assistant secretary-general was also endorsed, PM Lee noted. "I support the decision of the younger team, and am happy with this outcome. I have known and worked with Swee Keat and Chun Sing for some years now, and watched them grow in their different responsibilities," PM Lee said. "Leadership transition is always a complex and delicate matter. The younger ministers themselves must decide who is to lead them, as they have done in this process. "This way, they will give their full support to the leader whom they themselves have chosen," he added. "A smooth transition to the new team to lead us beyond the next elections is important not only for the PAP, but also for Singapore's future," PM Lee said. A group of 30 younger political office-holders also rallied behind Mr Heng and Mr Chan yesterday. In a statement sent out shortly after the CEC appointments were made public, they said: "We have been carefully considering the issue of leadership for the team." "In January, we issued a statement that we will choose a leader 'in good time'. Now, we have a consensus that the team will be led by Swee Keat... We endorse and support Swee Keat and Chun Sing as our leaders," the statement read. It was signed by MPs including Education Minister Ong Ye Kung; National Development Minister Lawrence Wong; Culture, Community and Youth Minister Grace Fu; and Environment and Water Resources Minister Masagos Zulkifli. The statement said they will "continue to work cohesively as a team, and forge a strong partnership with all Singaporeans". For many months, the fourth-generation (4G) team in the People's Action Party (PAP) deliberated over who they should pick to lead them. They eventually reached a consensus on Finance Minister Heng Swee Keat, 57. He was informed of their decision one month ago, which he accepted. The process of how the PAP's 4G team made their choice emerged yesterday at a press conference helmed by Mr Heng and his deputy, Trade and Industry Minister Chan Chun Sing, 49. Mr Heng said neither he nor Mr Chan was involved in the discussions. Both were the front runners to lead the ruling party into the future, and have since been picked as the PAP's first and second assistant secretary-general, respectively. Mr Heng said that after he was informed of their decision, he asked Mr Chan to be his deputy, and "Chun Sing agreed very quickly". Leadership renewal had always been a critical matter for the PAP, but was cast in the spotlight last year when Emeritus Senior Minister Goh Chok Tong wrote in a Facebook post on New Year's Eve that he hoped the 4G cohort could pick a leader in six to nine months. Responding several days later, the 4G leaders said they would pick a leader among themselves "in good time". Prime Minister Lee Hsien Loong had earlier said he intends to hand over the reins of government to his successor by the time he turns 70, which will be in 2022. Mr Heng said the 4G team had been discussing the issue of succession even before they issued their response to ESM Goh in January. Speaking to reporters after the press conference yesterday, Minister in the Prime Minister's Office Indranee Rajah said the selection process was amicable and friendly. She said Mr Heng has the ability to "draw everybody in and move forward as a team". "We wanted to make sure that we had the best team possible and we felt that Swee Keat would be a very good team leader, and Chun Sing also had very complementary strengths," she added. "We were happy that Swee Keat had asked Chun Sing to be his deputy." On why the process took so long, Ms Indranee highlighted the need to give the team opportunities to work together, consult one another, and have time for their views to be reflected. "I wouldn't say it was a difficult process, but it was a process that was considered, deliberate, step by step," she said. Senior Minister of State for Defence and Foreign Affairs Maliki Osman noted Mr Heng has worked closely with many 4G leaders, and demonstrated his consultative approach and leadership. "All of us are very confident that he will be able to lead us, moving forward," he said. Education Minister Ong Ye Kung, who was earlier regarded as one of the front runners to be the next prime minister, extended his heartiest congratulations to Mr Heng and Mr Chan, and said he is delighted the 4G team has a consensus on its leaders. "Today is a milestone in our leadership transition process, which is a hallmark of our political system," he wrote on Facebook. "It is all hands on deck. The stakes are high, we have a lot to do. I look forward to working with my colleagues and all fellow Singaporeans to make our home a better place." Political analyst Mustafa Izzuddin reckons Mr Heng pipped Mr Chan to the post of first assistant secretary-general due in part to his seniority and greater experience. Other Cabinet ministers endorsed Mr Heng and Mr Chan in separate Facebook posts yesterday. Foreign Minister Vivian Balakrishnan described Mr Heng as a brave, deeply compassionate and highly intelligent man with an incredible work ethic. "Hand over heart, I can say that he is the best man to lead us in the next phase of our journey," he said. Meanwhile, Mr Chan is a consummate officer and gentleman with a deep commitment to Singapore, and an excellent person to have in a crisis, Dr Balakrishnan added. Deputy Prime Minister Teo Chee Hean said Mr Heng is a man of integrity and ability who places service to Singapore before self, while Mr Chan is resolute, steadfast and will provide invaluable support. 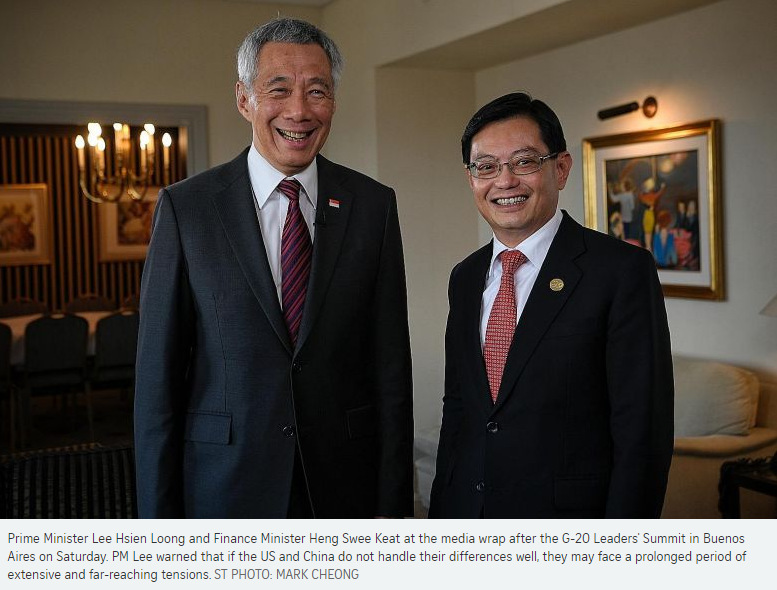 Deputy Prime Minister Tharman Shanmugaratnam said he shared PM Lee's confidence in the 4G team's choice of leaders. Asked if both he and Mr Chan will be named DPMs at the next Cabinet reshuffle, Mr Heng said that decision is for PM Lee to make. As to whether he will succeed PM Lee as Singapore's fourth prime minister, Mr Heng said it is critical for the 4G team to win the support of Singaporeans. "The PM has indicated the timeline for the next general election, so we are working hard to win the trust, confidence and support of Singaporeans," he added. "We fully appreciate the significance of today's milestone in the process of political leadership renewal. Singaporeans take a keen interest in the leadership renewal of the PAP. They will like to see a strong and united political leadership working in close partnership with our people to take Singapore and Singaporeans forward. Our three prime ministers were well-respected figures both at home and abroad. There is natural interest in who will succeed them, but it is just as important that we have a strong, united and cohesive team in the Cabinet. We must connect with our party members and our people and complement one another with our different strengths. The younger ministers have chosen me to be their leader, and I have accepted. It is my privilege to serve. I am deeply conscious of the heavy responsibility that I am taking on. Leading the party and governing Singapore are massive and complex tasks. No one person can do it alone. Not even Mr Lee Kuan Yew, who had the help of able, stout-hearted colleagues. I am heartened that I have the backing of a strong team. Our team has strengths in different areas and a range of skills to deal with a complex set of internal and external challenges. Based on our experience of working together in the past few years, I am confident that we will work well together to take Singapore forward and to improve the lives of Singaporeans. As the new team steps up to its responsibilities in the months ahead, I look forward to the continued support and counsel of PM and our senior colleagues. We must also continue to grow this team to continue assembling the most dedicated and most devoted group of men and women to serve Singapore. In particular, I have asked Chun Sing to be my deputy and he has agreed. I am grateful for his support and also thank my colleagues for supporting my choice. I am looking forward to working even more closely with Chun Sing. We have worked well together for several years now in the Our Singapore Conversation, organising the SG50 celebrations, the Future Economy Council and the party. Chun Sing has many strengths. Our styles and areas of expertise complement each other well. I am confident that in the years ahead, our partnership will grow even stronger. Together with others in the team, we can advance Singapore in different areas. I also thank all PAP MPs for endorsing me as the next leader and Chun Sing as the deputy at the party caucus today. As the President said at the opening of Parliament in May this year: "The right to leadership cannot be inherited, and every generation must earn the right to lead." We will work hard to earn the trust and confidence of Singaporeans, just as PM and his team did before. This is a very important task that has already begun and will gather pace. We will need new actions and new connections with every generation. Over time, we will develop our own style of governing in keeping with the aspirations and needs of Singaporeans. We will continue to reach out to Singaporeans at different stages of life and different segments of society, each contributing back to society in different ways. We will take concrete actions to address Singaporeans' needs and concerns. Singapore is still a very young country. After 53 years of going through thick and thin together, we are not done building the nation. We must dedicate ourselves to writing the next chapter of the Singapore Story. We must have confidence that we can make it happen. We look forward to partnering Singaporeans to build a brighter future for Singapore." Over the past few years, we have been working closely together and getting to know one another better - collaborating in committees and task forces, developing and implementing policies, and walking the ground. We thank our senior colleagues for their guidance and mentorship, and for graciously giving us opportunities to take on greater responsibilities. We have a diverse team, comprising members with different experiences, as well as complementary skills and strengths. We have been carefully considering the issue of leadership for the team. In January, we issued a statement that we will choose a leader "in good time". Now we have a consensus that the team will be led by Swee Keat. We also note that Swee Keat has asked Chun Sing to be his deputy, and that Chun Sing has agreed to do so. We endorse and support Swee Keat and Chun Sing as our leaders. We will continue to work cohesively as a team, and forge a strong partnership with all Singaporeans. We are united in our purpose of serving Singaporeans to the best of our abilities. 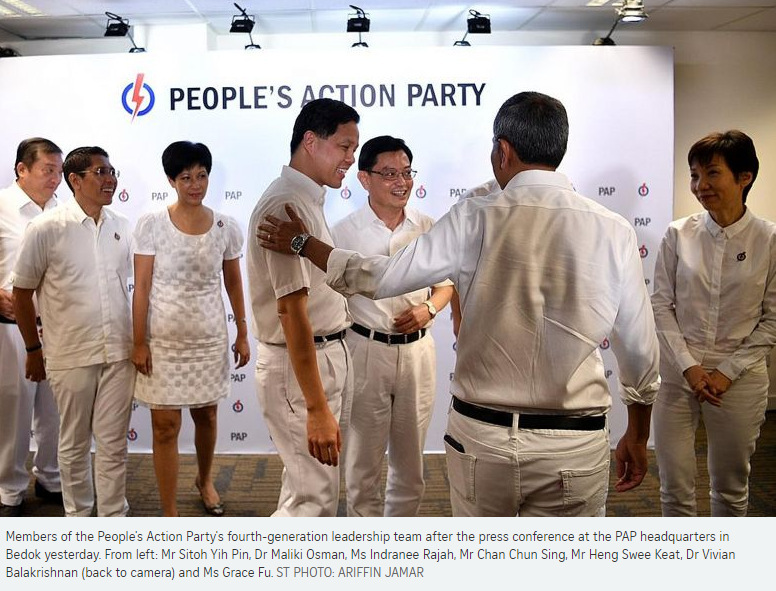 The People's Action Party (PAP) co-opted four new members into its highest decision-making body yesterday, and also named younger political leaders for key appointments. Changes in the ruling party's 35th Central Executive Committee (CEC) will see the 4G leaders stepping up to the plate, with more experienced members acting as advisers, political observers said. The four co-opted CEC members are: National Development Minister Lawrence Wong, Social and Family Development Minister Desmond Lee, and MPs Christopher de Souza and Sitoh Yih Pin. Finance Minister Heng Swee Keat, the PAP's newly minted first assistant secretary-general, said that four were co-opted after "very careful consideration" of the strengths that they could bring to the CEC's decision-making process. "What we want is to enlarge our CEC so that we can reach out to different groups of people, and to have people with perspectives that can add to the breadth and depth of our decision-making," Mr Heng said at a press conference yesterday. Mr Lee, who is also Second Minister for National Development, and Culture, Community and Youth Minister Grace Fu will be the CEC's organising secretaries. They take over the organising secretaries positions from Health Minister Gan Kim Yong, Trade and Industry Minister Chan Chun Sing, and Education Minister Ong Ye Kung. Mr Chan was chosen as the PAP's second assistant secretary-general, while Mr Gan is the new CEC chairman. Mr Ong will be the assistant treasurer, with Home Affairs and Law Minister K. Shanmugam as treasurer. The vice-chairman of the CEC is Environment and Water Resources Minister Masagos Zulkifli. The chairman, vice-chairman and treasurer positions became vacant after Transport Minister Khaw Boon Wan, and retired ministers Yaacob Ibrahim and Lim Swee Say, stepped down from the CEC. Deputy Prime Ministers Teo Chee Hean and Tharman Shanmugaratnam, who also stepped down from the CEC, were the previous first and second assistant secretaries-general. Prime Minister Lee Hsien Loong remains as the PAP's secretary-general. Dr Felix Tan, an associate lecturer at SIM Global Education, said of the new CEC office-holders: "There is a good balance between those who have the experience to continue policies within the party and the Government, and those who are coming with a new perspective, the younger leaders." Dr Tan said he expects the more experienced CEC members to take on an advisory role and see how the 4G leaders can "push the envelope". "They are coming in with a new perspective on how they can further improve on policies that have been around, or impending policies that will affect Singaporeans," Dr Tan added. The man who is poised to become Singapore's prime minister-designate will bring an open and consultative leadership style to the table, say those who have worked with him. Finance Minister Heng Swee Keat, 57, was announced as the ruling People's Action Party's (PAP) first assistant secretary-general yesterday, making him the most likely successor to Prime Minister Lee Hsien Loong. A few adjectives keep popping up to describe Mr Heng: Nice. Genuine. Soft-spoken. Kind. Indeed, the former top civil servant, who entered politics in 2011, is no stranger to garnering views, having chaired the year-long national movement to engage citizens, called Our Singapore Conversation, in 2013. He also led the SG50 Steering Committee to mark the country's golden jubilee in 2015 and, in his speech after the President's Address in May, announced that the PAP's fourth-generation (4G) leaders and MPs will launch a series of discussions with different groups of Singaporeans to seek their views and perspectives. In addition, he led the Committee on the Future Economy (CFE), which was tasked with generating new ideas for Singapore's growth. "Almost every meeting or site visit will go beyond the allocated time," said Singapore Business Federation chairman and former Nominated MP Teo Siong Seng, because the minister "wants to talk to as many people he meets as possible and find out what they are doing". Mr Heng had personally called Mr Teo to ask him to co-chair a CFE sub-committee with him, as well as to sit on the Future Economy Council that Mr Heng leads. "Some people will just get their secretariat to send an e-mail to you, and that is understandable because they are busy," Mr Teo said. "Mr Heng is one of the few who will call you personally." His consultative approach has lived up to his own expectations, which he shared with The Straits Times in 2011, before he was elected. At that time, he had said: "I think I have to do a lot more of that public engagement, of communication with the public. "I hope I can be persuasive. I hope that I will be able to engage Singaporeans from all walks of life." Yesterday, he reiterated this promise when he described his leadership style: "I am very open, I listen to all views and I decide what needs to be done." This genial demeanour, his colleagues say, belies a driven man who has excelled at every job he has taken up during an almost 30-year career in the public service. Mr Heng, who grew up in a kampung, won a Singapore Police Force scholarship in 1980 to study economics at Cambridge University in England. It was at the university that he met his wife, fellow Singaporean Chang Hwee Nee, a President's Scholar. She is now chief executive officer of the National Heritage Board, and they have a daughter and a son in their 20s. He joined the police force on his return and rose to become assistant commissioner. He then entered the elite Administrative Service in 1995, starting at the Education Ministry, and then becoming principal private secretary to then Senior Minister Lee Kuan Yew from 1997 to 2000. The late Mr Lee said he was "the best principal private secretary I ever had". Between 2001 and 2005, when he was the permanent secretary for the Trade and Industry Ministry, he skilfully wrangled benefits for Singapore when putting together free trade agreements, especially the ground-breaking 2005 pact with India that was notable for its complexity and range. His next job was at the helm of the Monetary Authority of Singapore (MAS). During his tenure as its managing director, he was credited with successfully steering Singapore's monetary policy through the country's worst post-independence recession in 2009, ensuring the Singapore dollar remained stable and the financial sector resilient. Some say he was invited to join politics as early as before the 1997 General Election. But what prompted him to want to play a part in shaping Singapore's future was the economic crisis, when he saw how close the nation came to the edge. He was appointed Education Minister shortly after, making him the second new MP ever to be catapulted straight into Cabinet. When he left the ministry after one term of four years and four months, Mr Heng had left an indelible mark on education, reshaping the system to focus not just on grades, but also the "intangibles" like character. He abolished the ranking of secondary schools that was introduced in 1992. In 2012, he did away with naming the top scorers in the Primary School Leaving Examination. A year later, the ministry took it a step further by not disclosing the highest and lowest scores, which had been listed on every pupil's result slip since 1982. The policy of not naming the top scorers also extended to other national examinations: N-level, O-level and A-level exams. Mr Heng also came to be associated with the slogan "Every school a good school", which reflects his vision to make every school good in its own way, to bring out the best in every child. The ministry also undertook a major review of the higher education sector and announced the creation of more university places so that by 2020, up to 40 per cent of every age group would have places. In September 2015, Mr Heng was named Finance Minister, taking over from Deputy Prime Minister Tharman Shanmugaratnam. He has delivered three Budget speeches since, with observers saying one of his defining traits is advising Singaporeans to see each financial report as part of the big picture, and not an annual goodie bag. He has also made tough decisions, including when he held his own in defending the need for a goods and services tax hike in Parliament earlier this year. MPs also say his tenure has been characterised by a desire to find solutions that best fit many groups of society, with several saying he had consulted them individually in the lead-up to the Budget. Fellow Tampines GRC MP and Senior Parliamentary Secretary Baey Yam Keng recalled Mr Heng's "demanding attention to detail", making multiple revisions to their local manifesto during the 2015 election. "He was very meticulous about the words we used. He wanted to make sure we could and would deliver on our promises to the residents," he added. Both former MAS colleagues and his fellow MPs say Mr Heng would work in the trenches with them, and had a habit of sleeping in the office during crunch time. "He is willing to make this adjustment in his personal life, that is his commitment level," said Mr Baey. "He works very late, and I hope that having had the scare of the stroke, he is able to strike a better balance." Some people had written off Mr Heng as a future prime minister after he had a brain aneurysm during a Cabinet meeting in May 2016. But when he came out of a coma six days after his stroke, the first words he scribbled on paper were: "Is there a Cabinet meeting today? Where are the papers?" He returned to the Finance Ministry in August that year, but stayed away from public events as he continued to build up his health. By February last year, he had delivered his second Budget speech, to rousing applause from the House. Mr Heng has since recovered, and yesterday told reporters he would not have agreed to be the 4G team's leader if he was not confident about his health. He is set to make his third trip this year to Argentina when he accompanies PM Lee next week to the Group of 20 Summit. He will also deliver his fourth Budget in February next year. In April this year, he was also tasked with overseeing the National Research Foundation. A former senior civil servant who worked closely with Mr Heng said: "I feel assured knowing he is our next leader because I know we will be in good hands." "In terms of maturity and knowing the country, he has the widest experience," she added. Veteran MP Charles Chong believes Mr Heng's leadership style will be closer to that of Mr Goh Chok Tong, rather than his mentor Lee Kuan Yew. "People will follow him because they love him, not fear him," Mr Chong said. "And he will find his own footing along the way." It was way past midnight, and Mr Sitoh Yih Pin and his supporters were still at a counting centre, waiting for the electoral result for the Potong Pasir single-member constituency. Finally, at 3am, the recount was over, and it was the last result in the 2011 General Election. Victory was declared for Mr Sitoh who, with his supporters, returned to the party's gathering centre at Toa Payoh Stadium. It was 4am, and there was hardly anyone there. But waiting for them was Mr Chan Chun Sing, one of the People's Action Party's (PAP) new candidates, who was widely seen as a potential minister and possibly leading the fourth generation of Singapore's leaders. That incident on May 8, 2011, the day after the election's Polling Day, is etched in Mr Sitoh's mind as it told him about the man and his leadership style. Yesterday, he recounted it to The Straits Times: "This was one of the 4G stars, PM Lee (Hsien Loong) was going to unveil him at a press conference, he didn't know me well at the time. Yet, he was there. As long as the last platoon has not come home, he was not going anywhere." Mr Chan had just left his role as the chief of army to join politics, and was elected MP for Tanjong Pagar GRC in the election. Within a month, he was named to the Cabinet as Acting Minister for Community Development, Youth and Sports and Minister of State for Information, Communications and the Arts. At age 41, he was the youngest in Cabinet. But politics initially had its bumps for the military man, who had spent 24 years in the Singapore Armed Forces (SAF). In the 2011 General Election rally, he was ridiculed by some people for using the Hokkien phrase "kee chiu", meaning "raise your hand", when posing a question to several elderly folk at a PAP rally. Perhaps the down-to-earth, chatty style had endeared the former chief of army to his men in green but, in politics, many suggest his folksy approach seems out of step for a potential bigwig in the Government who would represent Singapore on the world stage. Online critics were especially harsh, but Mr Chan seems to have stayed true to his heartlander ways. His informal style of speaking continues to be peppered with colloquialisms and Chinese dialect phrases. In 2013, as Social and Family Development Minister, he described the Government's strategy of offering overlapping layers of support to Singapore's needy as a "kueh lapis". Mr Chan's work over the years has evidently spoken for itself because yesterday evening, he was picked by the PAP as its second assistant secretary-general. The position puts him on track to be elevated to deputy prime minister in the not-too-distant future. It has been a swift rise through the ranks for the 49-year-old Trade and Industry Minister. A year after joining the Cabinet, he took charge of the newly created Ministry of Social and Family Development and, the following year, in 2013, he was promoted to a full minister and given what could be called a "homecoming" role: Second Minister for Defence. Unlike in the past, the new ministry has added significance in a Singapore embarking on building an inclusive society. Mr Chan introduced several key initiatives to strengthen Singapore's social safety net and support for families. They include the partner operator scheme, which gives eligible childcare operators government funding if, among other things, they keep fees affordable and raise the quality of care and education. In May 2015, he became chief of the labour movement. In his three years as secretary-general of the National Trades Union Congress, he expanded its scope to include more white-collar workers and professionals, managers and executives, a group that is growing fast and will make up two-thirds of the workforce by 2030. Mr Ken Tan, president of the Public Utilities Board Employees' Union, said Mr Chan's down-to-earth manner helped him relate easily to the unionists. "You can tell when you talk to him that he has the big picture in mind, but he knows how to speak the unionists' language," he said. "I learnt this from him - that when you are delivering a speech, focus on three key messages. Any more than that, and the audience cannot remember." Since joining politics, Mr Chan has hardly stayed beyond three years in a position. In April, a Cabinet reshuffle saw him become the Trade and Industry Minister. He was also named Minister-in-charge of the Public Service. The new portfolio is a new challenge, intensified by the rising tide of protectionism across the world, coupled with the trade war brewing between global giants China and the United States, while Singapore continues to push for open and free trade. Against this turbulent backdrop, Mr Chan collected a few wins, including a free trade deal between the European Union and Singapore. Meanwhile, the blockbuster Regional Comprehensive Economic Partnership trade pact looks set to be finalised next year. But even as he rose in government, Mr Chan did not let up on his commitment as an MP of Tanjong Pagar GRC. 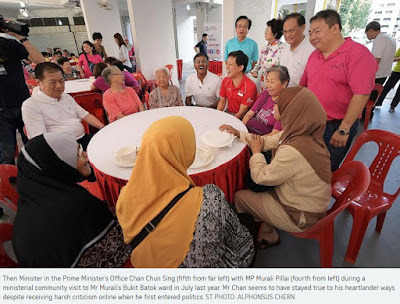 At interviews and other engagements, he often shares accounts of the residents he encounters at Meet-the-People sessions in his Buona Vista ward to illustrate his views about inequality and people's responsibilities towards one another. He recently shared his encounter with a single mother of six children who needed help to get a job and $300 in financial aid from the ComCare Fund for lower-income families. He contrasted the case with that of a young couple with a combined five-figure monthly income who complained they got only half of a $20,000 grant from the Housing Board. It was a "surreal" contrast, he said, showing how the more well-off in society can sometimes feel more entitled to government help. As the son of a single mother who raised two children on the meagre pay of a machine operator, Mr Chan's frugality is legendary. When he left the SAF in 2011, he was given, like all departing officers, an SAF watch. But he continued wearing his old, black, plastic Casio, explaining: "The battery hasn't run out." And he continues wearing it today. Although an old boy of the elite Raffles Institution, he gave short shrift to elitism and has strong views about how the successful should give back to society. At a conference last month, he said: "I would not hold it against somebody, regardless of his background, if he does well and makes a contribution to society. "But if someone has done well, not through his own effort but maybe through his connections... and doesn't reach out to people, then that is different." One theme clearly stood out from yesterday's People's Action Party (PAP) announcement of its new leadership slate: The numerous references to the need for the team to be cohesive and united. "United" was a word repeated no fewer than a dozen times throughout the evening - and it would appear to have been intentional. Shortly after the party's top decision-making body, the Central Executive Committee (CEC), met and released a statement on the PAP's new line-up at 4.30pm, two other statements followed. The first, on the PAP's Facebook page, was by its secretary-general, Prime Minister Lee Hsien Loong, who endorsed the decision of the fourth-generation (4G) team to have Mr Heng Swee Keat as their next leader, and Mr Chan Chun Sing as his deputy. Mr Heng's appointment as first assistant secretary-general is an indication that he is on track to be Singapore's next prime minister. Mr Chan was appointed second assistant secretary-general. PM Lee gave his vote of confidence to Mr Heng and Mr Chan, and pledged that "all of us in the new CEC, older or younger, will work together to build a strong and united party that will continue to serve the people and lead Singapore forward". A statement signed by 32 younger office-holders - including Mr Heng and Mr Chan - followed and endorsed the move to name both of them as their leaders. "We will continue to work cohesively as a team," it said. "We are united in our purpose of serving Singaporeans to the best of our abilities." Leadership transitions in political parties are generally never smooth, whether in neighbouring countries or farther afield. Recent cases in Australia, Britain and Germany show that jostling for pole position, lobbying, and mobilising factions to support one front runner over another are the norm. There is no reason to expect that the PAP - which has stayed cohesive for most of the 59 years it has been in power - might not one day face such divisions. It has had splits in the past, notably in 1961, when left-leaning members broke away to form the Barisan Socialis. Hence the many references yesterday to the need for cohesion and unity. While it appears aimed at reassuring those Singaporeans who may be concerned about whether the PAP will stay united, it is also for those party members who saw distinct differences between contenders for the party posts - and who might now be tempted to scale back their involvement, or even back another party, as the chosen leader may not be someone they preferred. The need for unity and the assurances that they will work as a team were underlined by Mr Heng and Mr Chan in their statements at a media conference an hour after their new posts were announced. Mr Heng said Singaporeans "like to see a strong and united political leadership working in close partnership with our people". And while there is natural interest in who will be the fourth prime minister, "it is just as important that we have a strong, united and cohesive team in the Cabinet". Mr Chan, too, echoed the point on teamwork, saying: "Teamwork is critical to us. Our team must be greater than the sum of our individual parts." Mr Heng disclosed that he specifically asked for Mr Chan - who many tipped as a contender for the top spot - to be his deputy. Both men have, in the past, spoken about the distinctiveness of Singapore's political model - at least as the PAP sees it - which sets it apart from other systems. Yesterday, Mr Heng stressed how he and Mr Chan would complement each other and help build a strong, united team: " I have seen so many examples of what is happening in other countries, where the energy is not focused on going forward, but instead... on the internal squabbles and on looking at the past." Mr Chan, too, emphasised that teamwork was a key takeaway for him from older political leaders. "No matter how good we are individually, it (excelling) is necessary but not sufficient," he said. "What distinguishes the Singapore team from the others who we are competing against... is the fact that we have a very cohesive team, and that is the hallmark of our leadership style." As new organising secretary Grace Fu told reporters later, it is unique that the party does not have "squabbles, divisiveness, light and sound in the process of renewal". This willingness to set aside personal ambition - and put Singapore first - is not a given. It was also why after speaking to the media, Mr Heng and Mr Chan also met leaders of the party's 89 branches to rally the ground. Yesterday's announcement was only the first major step in the current political transition. A Cabinet reshuffle is expected in months. There are also expectations a general election, a key test of popular support for the 4G leaders, could be called before the term of this Government is up. While differences over strategy, approach and policy may emerge, the key challenge for the 4G team is to ensure these are managed and that the cohesion achieved thus far is not disrupted. When a group of Singaporean pupils and teachers climbing Mount Kinabalu in June 2015 were killed in an earthquake, the leadership that then Education Minister Heng Swee Keat displayed in responding to the crisis left a deep impression on researcher Mohamed Salihin Subhan. Mr Heng was at the airport to comfort their parents, spoke personally to the students and teachers who survived the disaster, and went down and stayed in touch with their school to see how they were coping. Mr Salihin, 26, said Mr Heng's actions and words "cemented him in my mind as a capable leader", adding: "Not only did he work round the clock to prepare the ministry's official response and actions after the disaster, he also gave very good speeches which helped the nation mourn." Seven pupils and two teachers from Tanjong Katong Primary School were killed by falling boulders while ascending the 4,092m high mountain when the 6.0-magnitude quake struck on June 5, 2015. While Mr Salihin likes Mr Heng for his leadership capability and comforting words in a time of crisis, retiree Lee Kuang Chye, 73, appreciates him for his character in dealing with complaints and concerns from constituents. "One of my friends went to see him at a Meet-the-People Session and he was very patient," Mr Lee said in Mandarin. "It's rare to find people who really care about the ordinary people, but I think Heng Swee Keat is one of them." The two were among 50 Singaporeans The Sunday Times spoke to after Mr Heng, 57, who is now Finance Minister, was named the People's Action Party's (PAP) first assistant secretary-general on Friday, making him the most likely candidate to be Singapore's next prime minister. Mr Heng's fellow political office-holders in the PAP's fourth-generation leadership selected him to be their leader. And Mr Heng asked Trade and Industry Minister Chan Chun Sing, 49, to be his deputy. Mr Chan was named PAP's second assistant secretary-general on Friday. Most people interviewed had confidence in Mr Heng's capability and experience - he was a senior police commander and helmed the Monetary Authority of Singapore (MAS) - and felt he was the most suitable leader for the next generation. But a number also noted Mr Chan had strong credentials, was capable and had age on his side, making him a good deputy and possible PM. Mr Chan was former army chief and led the Ministry of Social and Family Development, and the labour movement before taking up his current portfolio. Temple volunteer Tan Kim Bee, 68, said that while both men are good, he feels that the Finance Minister "is able to connect better with the people, and seems easier to relate to". "Mr Chan's approach is different. It's good to have a balance. I think this is better for Singapore, because no one way of governing will work in the current day and age," he added. Many younger Singaporeans interviewed said they related to Mr Heng because they recalled his time as Education Minister. In his four years at the ministry, he did away with school rankings, expanded assistance schemes for students in need, and shifted the system's emphasis from grades to talent, and from qualifications to skills. Student Benjamin Wong, 23, said: "For people of my generation, he made an impression as Education Minister." Mr Wong sees the public outpouring of concern when Mr Heng suffered a stroke in May 2016 as a signal of how well-liked he was by people, and a recognition of his contributions to the country. The stroke had raised questions over his ability to weather the rigours of national leadership, but Mr Heng said on Friday that his doctors have given him "a clean bill of health", and that he would not have accepted the leadership of the party's 4G team if he was not confident that he was healthy. His health is not an overriding concern for many, like Ms Chang Yen, 25, who feels Mr Heng is well-qualified for the job. The communications professional said: "It's his experience and empathy that matter more." Some Singaporeans acknowledged Mr Heng's strengths but wondered about possible shortcomings. Researcher Aliff Faisal, 28, said the future PM would need more exposure so that citizens could get a clearer sense of him as a person and know what he stands for. "It would make him more relatable. He comes across as a soft-spoken, fatherly figure and a workaholic, honestly. And this combination seems to make him a dull person." Businessman Ruben Ang, 59, felt that while Mr Heng's financial know-how is important for leading the country, his personality had to shine through more for him to connect with Singaporeans. There were also some who felt Mr Heng's age could affect his staying power. Miss Shannon Chau, 27, a communications professional, said while Mr Heng has the experience to lead, she thought "they'd go with someone younger". Mr Heng is 57, and Prime Minister Lee Hsien Loong has indicated that he plans to hand over by the time he turns 70, in 2022. Mr Heng will be 61 that year, making him the oldest person to become PM in Singapore's history should he eventually step into the role. Mr Lee Kuan Yew became Singapore's first PM at age 35, in 1959. Mr Goh Chok Tong was 49 when he took the post in 1990. PM Lee was 52 when he took office in 2004. But a party insider noted that age should not be a factor at a time when many regional and global leaders are advanced in age. Many Asean leaders are well into their 70s, and across the Causeway, Dr Mahathir Mohamad became PM again at age 93. At the end of the day, Singaporeans told The Sunday Times that the question of which individual becomes the fourth prime minister does not really matter. The key is for the person to have the ability to lead and to have Singapore's best interests at heart. Mr Tan, the temple volunteer, said the entire 4G leadership will be required to work together in order to lead Singapore effectively. "It's always a team effort. So if he is able to work with the other ministers, then that is most important." Mr Malcolm Kang, 37, a stay-at-home father of two children, said the Government is bigger than the individual, and the leadership of Singapore will boil down to how the entire government performs. "I think who is in line to be PM doesn't really affect things, it's how the PAP and the Government conduct themselves," he said. But identifying a leader, said freelancer C. Woo, 28, enables the country to move forward. "I'm very relieved that they have finally made a decision. To have no successor creates a lot of anxiety and uncertainty. Now we shall see if we can concentrate on cementing his authority." Finance Minister Heng Swee Keat is a careful and deliberate leader who, in deciding on issues, wants to understand the deeper reasons behind why people have come to some views. Home Affairs and Law Minister K. Shanmugam gave this description of Mr Heng's leadership style yesterday, when asked for his comments on the ruling party's new first assistant secretary-general. He said Mr Heng would ask for information and viewpoints from different people when issues arise, before he makes a decision. "He doesn't look at them just at the top level," Mr Shanmugam told reporters during a grassroots event in Nee Soon GRC. Mr Heng, 57, was unveiled as the leader of the People's Action Party's (PAP) fourth-generation (4G) team on Friday, with Trade and Industry Minister Chan Chun Sing, 49, as his deputy and the party's second assistant secretary-general. Mr Shanmugam, who was appointed party treasurer, also said Mr Heng is a person "of the utmost integrity" who works very hard and is brilliant. Former Nominated MP Zulkifli Baharudin, who sat in a few Future Economy Council meetings chaired by Mr Heng last year, described him as "very patient" and "a measured person". He added: "Mr Heng always gave others the benefit of the doubt, listening to them and being respectful of their views." Former PAP MP Inderjit Singh reckons Mr Heng had the most support from party cadres and Singaporeans in general. He is thus glad the party leaders and 4G team "responded to the ground support" by choosing Mr Heng. Mr Singh also made the point that Mr Heng has had the most widespread experience before and after entering politics. A former assistant commissioner of police, Mr Heng also served as founding prime minister Lee Kuan Yew's principal private secretary, permanent secretary of the Ministry of Trade and Industry (MTI), and managing director of the Monetary Authority of Singapore. After getting elected in 2011, he became Education Minister and helmed key initiatives, including a national engagement exercise and a committee tasked with devising strategies for Singapore's economy. Mr Singh recounted how Mr Heng had asked to see him for advice on a new policy regarding incentive schemes to encourage entrepreneurship when Mr Heng was working at MTI. "Instead of asking me to go and see him, he came over to my office and spent more than an hour listening to me," said Mr Singh, chief executive of Solstar International. "He showed humility and a willingness to listen. I was impressed with his approach compared to many who sometimes get carried away with their position and ego." 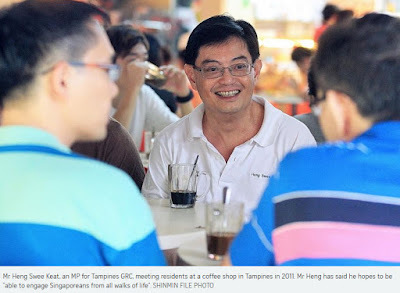 The former Ang Mo Kio GRC MP added that Mr Heng is well liked and a good listener who connects well with the ground. Mr Chan has wider experience in helming more ministries and that will be useful, Mr Singh said. But one area the former army chief can do better in is connecting with the man in the street, he added. Besides MTI, Mr Chan has held various portfolios, including Minister for Social and Family Development, Second Minister for Defence and labour chief. Mr Shanmugam said Mr Heng and Mr Chan have given their entire adult lives to public service. Both started from extremely humble beginnings, and "exemplify the true Singapore spirit for people who talk about upward mobility", he said. Mr Heng grew up in a kampung, while Mr Chan lived in a rental flat with a single mother. Mr Shanmugam added that he is optimistic and confident about the PAP's 4G leadership. "The team has to be further strengthened by bringing in more people during the next elections," he said. "But (when) you get that, I think Singapore will be in good hands." In his first comments on the appointment of Finance Minister Heng Swee Keat as the People’s Action Party’s (PAP) first assistant secretary-general, Emeritus Senior Minister Goh Chok Tong said that Mr Heng and Mr Chan Chun Sing, chosen as his deputy, have complementary strengths. Speaking to Channel NewsAsia on Monday (Nov 26) to discuss his newly published authorised biography Tall Order, Mr Goh noted that while Mr Heng’s strengths lay in his strong experience in governance, he “hasn’t quite been exposed to the mobilisation of people, working with the PAP, the NTUC (National Trades Union Congress), and working with the PA (People’s Association)”. “Chan Chun Sing has that,” Mr Goh added. The former prime minister recognised that Mr Chan would have "experience in running some ministries, but his strengths so far have been exposed in those mobilisation areas". “So, the two will work very well, they’ll complement one another,” Mr Goh said. Mr Goh’s comments came days after Mr Heng was appointed as the PAP’s first assistant secretary-general, in a move that indicates the finance minister is the clear frontrunner to replace Mr Lee Hsien Loong as Prime Minister. Mr Chan was appointed second assistant secretary-general, with Mr Heng choosing Mr Chan to be his deputy. 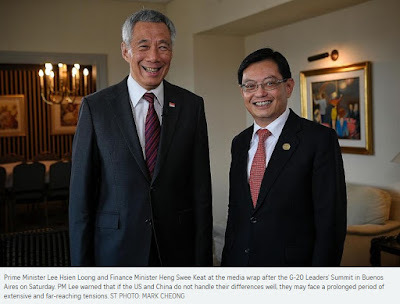 Mr Goh’s comments echo those of Mr Lee, who said the two new assistant secretaries-general have “complementary strengths, and make a strong pairing”. 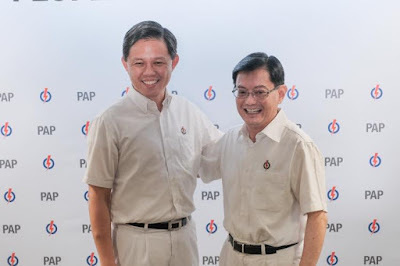 Asked if he felt the younger fourth-generation (4G) leaders may have made their choices for the PAP’s new leadership based on this complementarity between Mr Heng and Mr Chan, Mr Goh demurred. “That’s not quite so,” he said. In his interview with Channel NewsAsia, Mr Goh was asked if the party’s eventual decision to back Mr Heng could simply have been delayed, given the stroke that he had suffered in May 2016. The issue of timelines in the PAP’s leadership transition was one that Mr Goh had himself raised, most specifically in his public intervention on Facebook on New Year’s Eve last year. Writing at the time, Mr Goh had said that: "One urgent challenge I would like to see settled is our fourth-generation leadership. "Every succession is different, but one thing remains the same: Each cohort will have to pick one amongst themselves to lead, and support him. I hope the current cohort will do so in six to nine months' time. "Then PM can formally designate their choice as his potential successor before 2018 ends." Asked why he had chosen to intervene at that point, Mr Goh brought the issue back to his early political experience, where he was first introduced to “managed political succession”, first to introduce candidates to politics, and thereafter to manage transitions between leaders. Mr Goh added that by his calculations, based on Mr Lee’s intention to step down by the age of 70, the current transition had at that time “taken a little longer”. Nonetheless, with the party’s decision having since been taken, Mr Goh said: “I am very happy that they have decided now to pick the leaders. Obviously, the team players are very good, the individual players are very good. 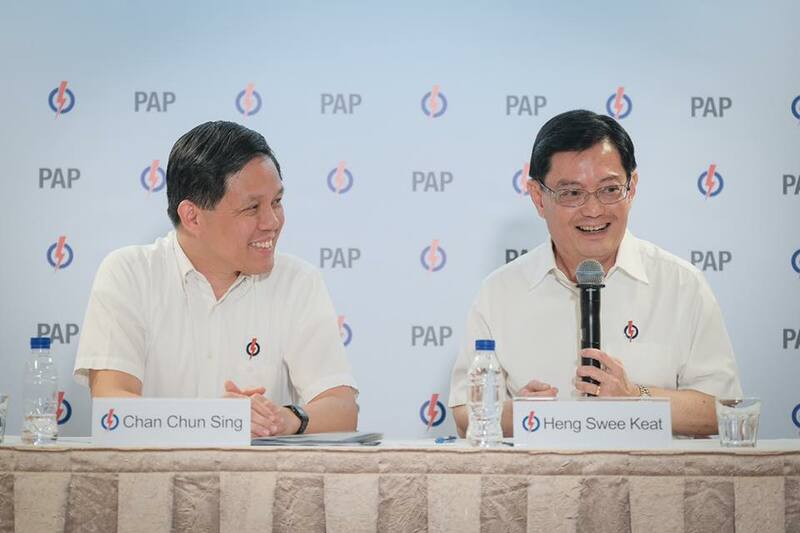 In his remarks following the announcement of his appointment, Mr Heng had pointed to the importance of the overall PAP leadership team in delivering on governance for Singapore. "I'm deeply conscious of the heavy responsibility I'm taking on, leading the party and governing Singapore are massive and complex tasks," he said. "No one person can do it alone, not even Mr Lee Kuan Yew who had the help of able, stout-hearted colleagues. I'm heartened that I have the backing of a strong team." These were comments echoed by the 32 younger political leaders who endorsed Mr Heng as their leader. In their statement issued following the leadership announcement, the group referenced the strong group dynamic, and pledged to “continue to work cohesively as a team”, and being “united in our purpose of serving Singaporeans to the best of our abilities". Asked to explain the underlying PAP psyche in highlighting the ultimate importance of the team, Mr Goh said: “To run the country, you need the whole team, and of course if there are many people who could form a Cabinet and there is a strong man, it’s good; that means there is a strong leader. “But strong leaders need a team to get things done,” he added. “So Mr Lee Kuan Yew was a strong man, but he needed core members to help him: Goh Keng Swee, Rajaratnam, Othman Wok, they were the core members of his team, but beyond them, we had a larger team: Ong Pang Boon, Toh Chin Chye, Chua Sian Chin, the other ministers. So you do need a team to run a country. “Well, I think so,” Mr Goh replied. “I think there must come a time where somebody says I want to be the leader. Looking at individual strengths, Mr Goh said Mr Heng has the ability to deal with a crisis, raising the example of when Mr Heng was the managing director of the Monetary Authority of Singapore, and himself the chairman. Changes to the Cabinet to put younger ministers in key posts will be announced some time after the Budget debate next year. Prime Minister Lee Hsien Loong indicated this timeframe for a reshuffle in an interview with Singapore media last Saturday in Argentina, where he was attending the Group of 20 leaders' summit. The Budget debate ends in March, and PM Lee hinted the changes could be made in April or May. But for the leadership transition to the fourth-generation (4G) team to go according to plan, the People's Action Party (PAP) must first win the next general election, PM Lee added. "It depends on the party staying together and the party winning elections. And the first thing to do will be to win the next election," he said. Finance Minister Heng Swee Keat is expected to be deputy prime minister, the post which the second and third PMs - Mr Goh Chok Tong and Mr Lee - held while they were earmarked for the top post. Mr Heng, 57, was announced by the PAP as its first assistant secretary-general on Nov 23 following internal party elections, making him the most likely candidate for future PM, while Trade and Industry Minister Chan Chun Sing, 49, was named its second assistant secretary-general and Mr Heng's deputy. Asked if Mr Heng would be the country's fourth prime minister, PM Lee replied that the PAP had made it clear that Mr Heng would be its next leader. "The 4G ministers have decided that Swee Keat will be their leader... and the MPs have endorsed this conclusion. The party's position is clear." But he added: "First, we have to fight an election, we have to win the election and after that if all goes according to plan, well the succession happens within the PAP, there are no surprises." PM Lee said this mechanism for leadership transition had worked out well for Singapore in the past, by providing stability, continuity and renewal of leadership and policies. PM Lee, 66, had previously said he hoped to hand over the post of PM to his successor by the time he turns 70 in 2022. The next election must be called by January 2021. Asked if he would appoint Mr Heng as a DPM at the upcoming reshuffle, PM Lee replied: "In due course I will reshuffle Cabinet, then you will see what we do." The last reshuffle was announced in late April this year, and PM Lee added: "So next year around the same time, I think it is reasonable." PM Lee also gave a flavour of how the fourth generation of leaders would take the lead in the coming election. They will do so by setting the party's agenda, working out its policies, preparing the manifesto, making the pitch to the public, actively campaigning and organising the election, he said. "The 4G will be very much in the thick of things. Even in the last election, they were very actively involved in organising although... I was more prominently making the pitch," he said. "I'm still the leader, so in the next election, I will be the leader and I will lead the party into the election. But the content of the policies and how they are presented, and what they want to do, I think the young ministers will have a lot to say about that," he added. PM Lee also said the PAP would be going into the next election with a team that has "depth" - comprising not just the PAP's present leaders who are in their late 50s and early 60s, but also "the next generation of leaders in their 40s and 50s, ready to take over". "That's a very strong message, which goes beyond any specific policies and manifesto items or promises," he said. "The commitment is we are here to serve and not just for now, but to serve into the future and you can rely on us." Mr Heng said the 4G ministers will launch a series of discussions with different groups of Singaporeans after the Budget. These will build on the Our Singapore Conversation feedback drive he led in 2013, he added. "We want to have some time to look at what are some of the fundamental, long-term issues that as a country, as a society, we need to address." The fourth-generation (4G) ministers will launch their planned series of discussions with Singaporeans after next year's Budget, said Finance Minister Heng Swee Keat. These sessions with different groups of people will build on the Our Singapore Conversation national feedback drive he spearheaded in 2013, said Mr Heng. "In the last few months, the team has been working very hard to discuss the topics, issues that we want to discuss with Singaporeans, and also how do we do it," he said. "We had Our Singapore Conversation (OSC); it was much more open-ended. We want to build on the OSC and, at the same time, we want to have some time to look at what are some of the fundamental, long-term issues that as a country, as a society, we need to address." He gave the update on the series, first announced in May this year, in an interview with Singapore media on Saturday after the end of the G-20 summit, which he attended together with Prime Minister Lee Hsien Loong and Foreign Minister Vivian Balakrishnan. Mr Heng was picked by the People's Action Party's 4G ministers last month to be their leader, putting him in line to be Singapore's fourth prime minister. He, in turn, announced that he had asked Trade and Industry Minister Chan Chun Sing to be his deputy. On the discussion series, Mr Heng said the 4G ministers will continue with more in-depth planning discussions in January before taking a pause for the Budget and parliamentary debates over ministries' budgets, he added. They will then start discussions from April on details before they "engage all Singaporeans on this very important effort to continue to build our nation", he said. Mr Heng also shared further details of how his 4G colleagues deliberated on who would lead them. He said the younger leaders had been consulting one another and, after a period of time, they decided among themselves that both he and Mr Chan Chun Sing were possible candidates. Mr Heng said that he was not involved in his fellow ministers' discussions as to which of their final two candidates they would choose as leader. Asked how long the discussions took, Mr Heng said: "It took them several months and I told them: Please discuss it thoroughly so that you can get as wide a range of views as possible." After his colleagues informed him of their choice, Mr Heng said he had a "very nice discussion with Chun Sing". Mr Heng said he asked Mr Chan to be his deputy. "And he readily accepted, so I am very happy with that," he added. "I want to ensure that we maintain that unity in the team and that's why I had such a good discussion with Chun Sing, not just on being the leader and deputy, but also on what we need to do to take Singapore forward," Mr Heng said. "We are both very clear that it is not about lobbying younger office-holders for a particular position, but about reaching agreements on how we can do this well and the agenda for taking Singapore forward," he added.